Written by Kirsty Lloyd, CryoArks Technician at the Natural History Museum London. On Wednesday the 25th of July 2018 I attended my first Geological Curators’ Group Event. I confess I am not a geologist or a curator, my background is natural history. At the time I worked in museum learning, when I saw the replica making course advertised via the Natural Sciences Collections Association website I instantly thought of the amount of activities and events myself and my team could run if we could make replicas of our few fossil specimens. Is the specimen for handling, e.g. for education workshop and events, do you need more of them? Or is it a one off? Is it rare or at risk of damage? Is a copy needed for research or to preserve the detail of a valuable specimen? Do you even need to make a replica, could you use a 3D scanner or printer instead of affecting the actual specimen? Although the silicone rubber used would not damage the specimen structurally as it only sticks to itself (and possibly other silica-containing materials), it will have a chemical effect (note to self; do any chemical analysis first). Making a physical copy of a specimen may have a lot of value. There is even the possibility that a replica might take on a life of its own, like Dippy the Natural History Museum’s Diplodocus cast that is currently travelling around the UK on its very own tour. One of the things I liked most about this course was how informal and hands-on it was. After our short chat about the things to consider before making a replica, there were no PowerPoints or lengthy introductions, we just got cracking! 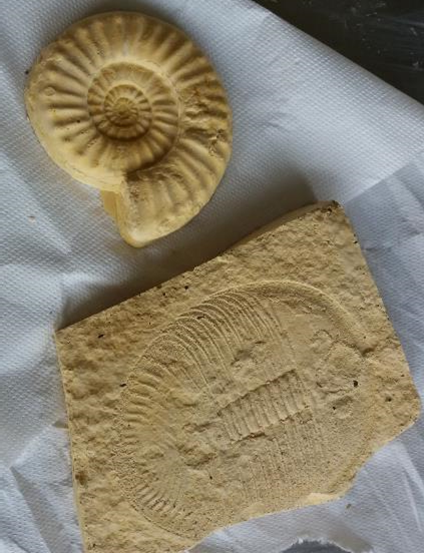 Setting the fossil in clay (left) and sealing the fossil housing (right) © Kirsty Lloyd. The first thing to do is make your silicone mould. Helpfully, moulding may actually help to clean your specimen. The dirt will come off when the mould is removed which is great for small specimens but will change its appearance and can be really obvious on a larger specimen. The silicone rubber will get in any cracks on the surface of your specimen, it will set and be very difficult to remove. It will also lock into porous material. You can put a seal on your specimen with waxes, soaps, conservation grade paraloid or renaissance wax. But, ultimately there is a risk of leaving residues from the clays, rubber, and incorrect mixing of components, and even accidental damage during application or removal. So, conduct a condition survey beforehand, do a small test on a less valuable piece first and if in doubt don’t risk it. We used a piece of Correx (a corrugated plastic board) as a base and Plasticine or modelling clay to fill in any voids or cracks to ensure there were no undercuts. If the silicone is able to get around/beneath the specimen it will undercut and once set it will not release! 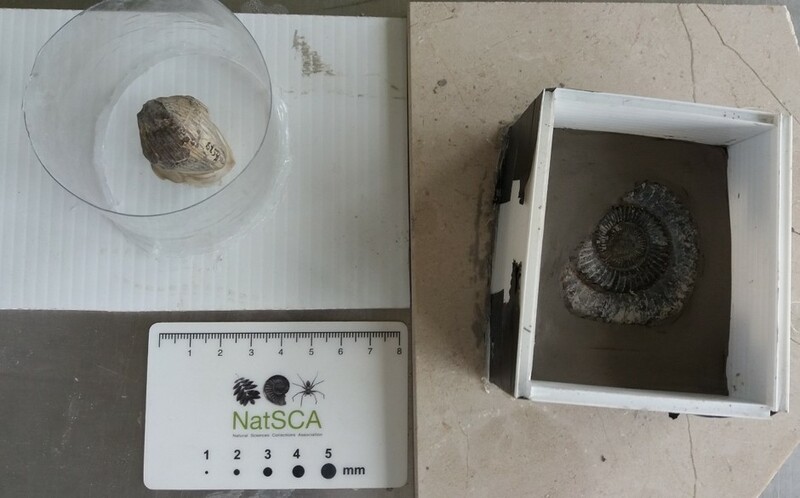 It was also possible to make a clay base to raise the specimen to prevent undercuts and to make a two-sided mould where the whole specimen is captured instead of just a single side. The next step was to build an enclosure for your specimen. Some people made little clay bowls, whilst others decided to build mini forts! The key is to make sure you seal your enclosure completely. Some used tape whilst others stuck the fort walls to the base with a glue gun. Then treat the specimen with a release agent (usually a detergent and alcohol mixture). Fossils prepared ready for the mould mixture to be poured. © Kirsty Lloyd. 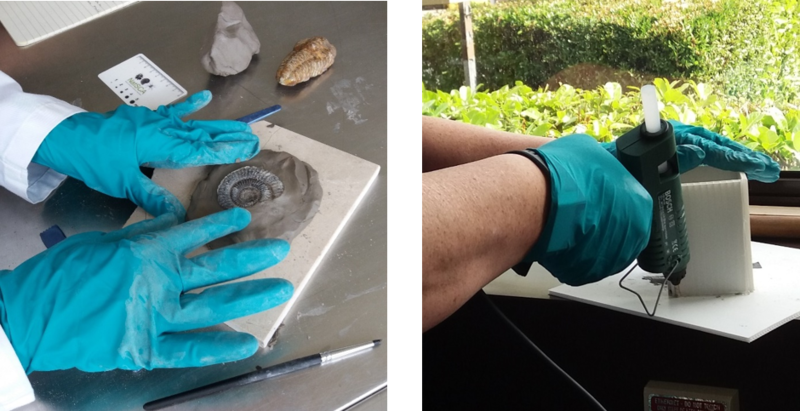 Pouring the catalyst into the mould mixture (left) and painting on the fossil (right) © Kirsty Lloyd. Next, we calculated the amount of rubber mixture we would need to make based on the volume of our fossil enclosure. When the catalyst is added to the rubber you only have a limited amount of time before it is set so speedy, thorough mixing is required. Unless you are using a “no-vacuum” rubber, you may need to place your rubber mixture into a vacuum chamber to degas it. Another top tip when pouring the rubber mixture was to first pour a small amount onto the specimen and use a disposable brush to work the rubber into the detailed areas, giving your specimen its ‘beauty coat’. Then pour the rubber into the corner of the mould. Pour high and keep still to allow the mixture to rise around the specimen until it is completely covered. Our fort building was definitely put to the test and some of us found out what happens if you do not seal your specimen enclosure well enough! Mould mixture leaking everywhere! © Kirsty Lloyd. As our moulds were setting we had a go at making the casts out of plaster of paris. In true Blue Peter style there were plenty of moulds available for us to practice with. We were hoping for a magic ratio of plaster to water but like cooking it mostly seems to come down to judgment. Everything you need for a plaster cast © Kirsty Lloyd. The general rule of thumb though was to use half the volume of water than your mould and add the plaster into the centre until you have a plaster island that will no longer be submerged. Wait for 1 minute for the water to rehydrate the powder and stir until it is the consistency of double cream. You can add colouring to give your cast a more authentic look and even use resins with metal colourants and fillers like pewter and bronze! 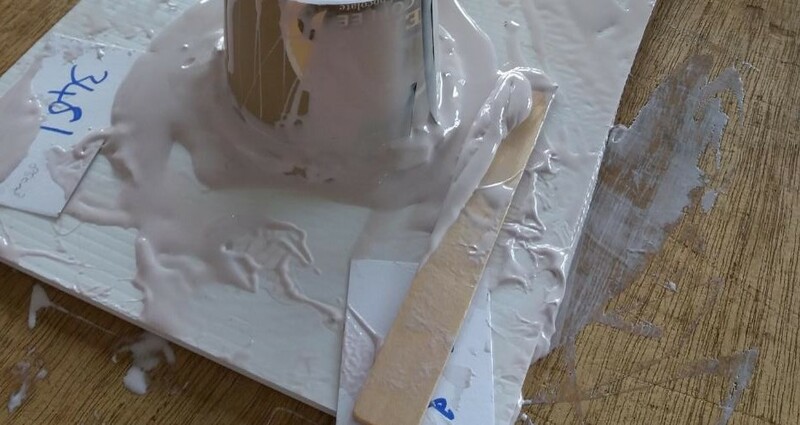 Yet another top tip was to use another disposable paint brush to brush the plaster mixture around the mould and remove any bubbles. Pour in the rest and tap to dislodge any more bubbles. The setting reaction is exothermic so it did get quite hot as it was setting. Once it has set fully it is easy to de-mould and you can marvel at your wonderful cast! Getting a bubble free mould and cast is definitely something that takes practice and a bit of trial and error, but it was fun to do. I left the course with some handy hints and tips, my own casts which I had set myself, a feeling of accomplishment and a keenness to give it a go back at work. My casts © Kirsty Lloyd. 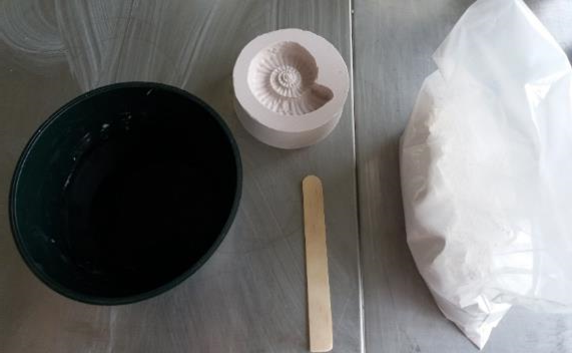 The Moulding and Casting Workshop was a GCG run event, led by Simon Harris, Conservator at The British Geological Survey in Keyworth, near Nottingham. If you are interested in knowing about future events like this, you can check our website or contact our Programme Secretary on events@geocurator.org.